One of Ellis Parker Butler's funniest Perkins of Portland stories -- 'The Adventure of the Lame and Halt' from 1904. H. C. Bunner, the editor of Puck Magazine from 1877 until his death in 1896, had a knack for writing fun short stories with great characters and sly twists. 'What Mrs. Fortescue Did,' from 1894 is one of the lost gems of American Humor, and we re-present it here. Charles Battell Loomis offers an extremely funny tale about that newfangled device in 'Araminta and the Automobile' from 1903. Stephen Leacock's 1918 story 'To Nature and Back Again' is one of those extremely funny, timeless tales that make doing this podcast worthwhile. It's really, truly hilarious! 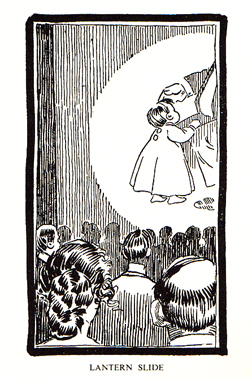 One of Charles Battell Loomis's most consistently funny stories, 'An Eastern Easter,' from 1901, is also one of his most delightfully charming. Not to be missed! Charles Battell Loomis tells us of a young lady with a true Gift for Gab in 'Little Miss Flutterly's Dissertation on War' from 1901. Charles Battell Loomis wrote very funny stories with well-rounded, fascinating characters. 'Truman Wickwire's Gloves,' from 1901, is a tale of a truly mean man getting his comeuppance. George Ade explains exactly how many hoops a beau needs to jump through in 'The Fable of What Horace Stood For in Order to Land the Queen' from 1904. George Ade discovers the perfect way to get a job in 'The Fable of the Two Ways of Going Out After the Pay Envelope' from 1904. Ending a week of James M. Bailey stories with a tale of seeing a show (or not seeing it) in 'Circus Day in Danbury' from 1873. Counting to 100 is a great way to control your temper -- or is it? 'Anger and Enumeration' written back in 1873 by James M. Bailey tries to answer that very question. James M. Bailey found a lot of humorous stories among his neighbors in suburban Connecticut in the 1870s. 'An Early Martyr,' from 1873, describes what could only be termed total pandemonium. George Ade explains how selective amnesia comes and goes in 'The Fable of the Cottillon Leader from the Huckleberry District with the Intermittent Memory,' from 1900. George Ade brings us a really short but funny story of an ever-suffering wife in 'The Fable of the Martyr Who Liked the Job' from 1899. Ending a week of Francis A. Durivage's stories with a strange but hilarious tale of the Gold Rush -- 'California Speculation'-- written in 1853 (while the Gold Rush was still going on). A twenty mile train ride turns into total pandemonium due to the 'helpful' actions of 'The Obliging Young Man,' an 1853 story by Francis A. Durivage. A charmingly clever story from 1853 -- Francis A. Durivage's 'A Kiss on Demand' involves a surreptitious kiss and an ironclad contract. Francis A. Durivage's 1853 tale of an avenged insult and a fierce temper, 'Personal Satisfaction' is a fascinating (and funny) glimpse of a time gone by. This is the 300th Episode of Mister Ron's Basement! This week we are featuring humorous stories by the long-forgotten Francis A. Durivage -- Today's is a tale of someone taking the long, long, long way home -- 'Obeying Orders,' from 1853. A 1903 Two-Parter from George Ade -- Part Two -- 'The Married Couple That Went to Housekeeping and Began to Find Out Things' --Part One was posted in the previous Episode of Mister Ron's Basement. A 1903 Two-Parter from George Ade -- Part One -- 'Two Young People, Two Photographers, and the Correspondence School of Wooing' --Don't miss Part Two in the Next Episode of Mister Ron's Basement! Serializing F. Scott Fitzgerald's lengthy (but fun) short story about a prodigy and a stage star -- 'Head and Shoulders.' Today, we offer the conclusion, Part Five of Five. Serializing F. Scott Fitzgerald's lengthy (but fun) short story about a prodigy and a stage star -- 'Head and Shoulders.' Today, we offer Part Four of Five. Serializing F. Scott Fitzgerald's lengthy (but fun) short story about a prodigy and a stage star -- 'Head and Shoulders.' Today, we offer Part Three of Five.